Dave is a Shareholder and the practice Co-Chair of the firm's Corporate & Tax Group. He has practiced banking, corporate, and securities law in Tampa and New York City. While with Simpson Thacher & Bartlett in New York, his practice focused on acquisitions and public and private securities offerings, including representation of a major leveraged buy-out firm and several major underwriting firms. Dave's practice principally involves securities offerings, venture capital investments, mergers and acquisitions, and representation of public, established and emerging growth companies. Dave acts as counsel to a number of institutional venture capital and private equity investors, including Lovett Miller & Co., Ballast Point Venture Partners, HealthEdge Investment Fund, Supply Chain Equity Partners and Stonehenge Capital. Dave acts as counsel to public companies with respect to securities and governance matters, including defensive measures, Exchange Act reports, SRO requirements, audit and compensation committee practices, annual meetings, and general advice to Boards of Directors. Dave is a founder and the principal organizer of The Florida Directors’ Institute, an annual full-day program on corporate governance for public company directors. Dave is a past Chair and on the Executive Committee and Board of Directors of the Florida Venture Forum. Dave has chaired The Florida Bar’s Business Law Section, its Corporations and Securities Law Committee, and committees responsible for drafting laws governing Florida corporations and guidelines for legal opinions. He continues to serve on the Executive Council of the Business Law Section. Dave is a Co-Chair of the annual Southeastern Private Equity and M&A Forum in Atlanta, Georgia. Dave also serves as a faculty member of the annual Federal Securities Institute, a two-day program in Miami, and has spoken at seminars throughout the United States regarding securities offerings and compliance, private equity capital raising transactions, corporate governance, mergers and acquisitions and lending deals. 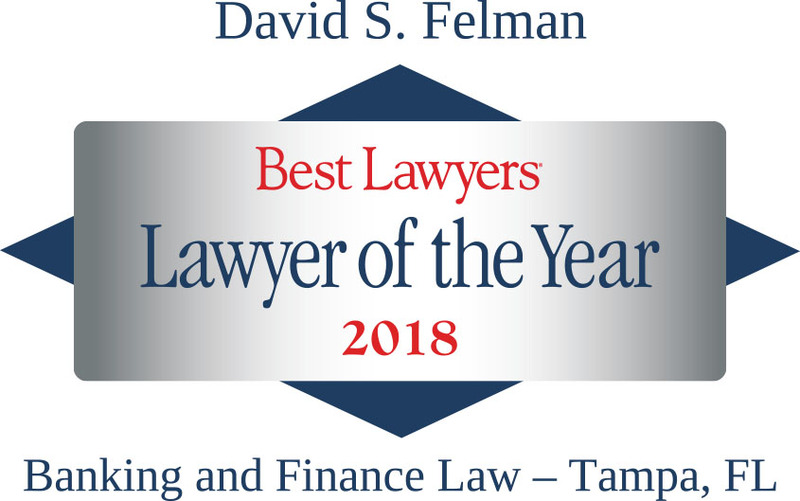 Dave has been recognized by Best Lawyers as the Lawyer of the Year in Tampa Bay in five of the last six years, including in mergers and acquisitions. He is one of only seven Florida lawyers to have the highest Band 1 ranking in mergers and acquisitions in Chambers USA. Dave and his wife Judy have three sons, Matt, Jake and Daniel. He enjoys fishing, and playing chess. "Developments in Private Equity and Venture Capital Deals." 2017 Federal Securities Institute, Miami, FL. "View From the Private Equity Funds." 2016 Southeastern Private Equity & M&A Forum, Atlanta, GA.
"Using Report Warranties Insurance to Gain a Strategic Advantage. "2016 Federal Securities Institute, Miami, FL. "Developments in Private Equity Transactions." 2015 Federal Securities Institute, Miami, FL. Strategic Investors/ Acquirers Panel, 2014 Florida Venture Forum, Orlando, FL. "Developments in Private Equity M&A Transactions." 2014 Federal Securities Institute, Miami, FL. "Private Equity Roundtable," 2013 Southeastern M&A/ Private Equity Forum, Atlanta, GA.
"Break-ups, Bear-hugs, and Go-shops; Responding to a Hostile Approach and Selling a Public Company." 2012 Southeastern Private Equity and M&A Forum. "Break-ups, Bear-hugs, and Go-shops; Responding to a Hostile Approach and Selling a Public Company." 2012 NACD National Leadership Conference, National Harbor, MD. "Fads in Venture Capital Term Sheets." 2012 Florida Venture Forum, Naples, FL.